I have serious ire for automated systems. Needless to say, I am disturbed as I’m sure many of you are when they call up somewhere to talk to a human being and are met by a pseudo human being that prompts you to go from one place in the cyber phone abyss (or hell as I call it) to another, until you’re trapped in some endless maze that costs you ten pounds (dollars) a minute and gets you absolutely nowhere. This happened to me the other day when I was trying to call my credit card company (bank, mileage plus program, school, doctor, store…ETC) to answer a simple question about my account. Ah yes, the automated systems make nothing simple; in fact, they are designed to drive you freaking bonkers. It’s hard to determine what part of this whole experience drives me the most nuts? The antiseptic, saccharine moronic woman’s voice that tries to soothe me through the process (why is it always a woman? must be a trust/nurturing thing. 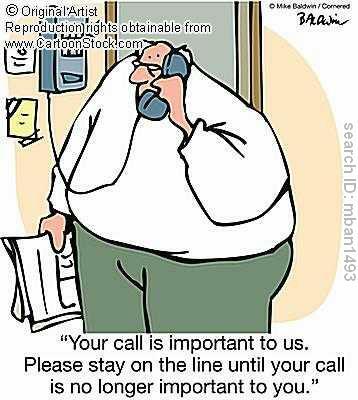 'Yeah, let's pick a woman, the callers will think it's their mother')…or the fifty years you spend on the phone trying to get to the right department before being disconnected? Or the kicker, the phone bill at the end of the month that makes your eyeballs bulge because you forgot it was not a 1-800 number (as I’m calling international half the time, 800 numbers are lost on me). Moreover, the woman on the phone always seems to want to funnel you to a website or a delightfully informative series of prompts that are designed to anticipate your questions (but never seem to have the answer to the question I want to know), and most importantly, never seem to give me the prompt that says, press four if you are enraged and want to speak to a human being – that is not in a call center in India - that can actually answer your question for you. I’m one of those people that just keeps pushing the number zero until either someone comes on the line or the phone blows up. I of course simultaneously curse out the robot that is telling me how to reach the right department but never seems to take me there. Needless to say, by the end of the phone call, I’m irritated, foul mouthed, and still not able to answer the question I had in the first place – which I’ve often forgot about, as the phone call takes so darn long. Of course, the whole design of these systems is to save the company money, which makes me even more annoyed, as the person paying for the lengthy phone call is the consumer. You see how many different ways we get screwed? The other day I actually got put through to a person in under five seconds. I was so shocked I became a stuttering mess and couldn’t actually articulate what I needed. It was somewhat embarrassing, and yet, by the end of the phone call I practically invited the woman to tea because she was so darn sunny and helpful. You see, we the public has simple needs and desires. Just talk to us in a non-robotic voice, and next thing you know, we’ll sign up for another year, take out another credit card or triple our cable package. I’m telling you, we’re suckers like that.